Windows and doors are often overlooked when it comes to building an energy-efficient home. Did you know that your windows can be responsible for almost half the air conditioning load? Be sure to look for Low-E glass for your windows and doors. Read more about energy efficient windows at the Texas Window Initiative. Did you know that a 4x8 window does not always fit within a 4x8 hole? Not all manufacturers size windows the same. Even within the same manufacturer, a wood window and an aluminum window will be sized differently. When working with your architect, you will have to determine which manufacturer and model windows you want before the plans can be completed. He will need the specs; otherwise, he cannot draw the plans correctly. The same can be true of doors, so be careful. Wooden windows and aluminum windows are oftentimes trimmed out (placed in the wall) differently. The window sills can be significantly different between the two or they can be finished out in a very similar manner. This makes a difference for the types of window coverings you will use. You need to discuss this with builder, window rep, and your interior designer. We prefer large doors in our home. Most of doors are 3' wide with 8' tall doors downstairs and 6'8" tall doors upstairs. You will appreciate wider doors when it is time to move furniture into a room. For instance, your utility room needs doors wide enough so that you can move washers, dryers, and freezers into it. Your bedrooms need doors wide enough to accommodate chairs, sofas, desks, and armoires. Most custom homes have solid wood doors downstairs and hollow doors upstairs. We chose solid doors throughout the home. If you choose wooden windows, pay careful attention to the window hardware, especially the crank you use to open the window. Will it interfere with your window coverings? Do you like the looks of them? Your door hardware is important because not all doors use the same type keys. If you want all of your exterior doors to be keyed the same, find out what type of mechanism they use. For instance, Pella uses Schlage-compatible locks. We keyed our exterior doors the same, but some of our interior doors have keyed-locks also. They were keyed differently. This allows us to have closets that are locked from children. Many homes will have a medicine closet, gun closet, liquor closet, or locked doors to the attic. Oftentimes your door hardware is chosen at the same time that you choose plumbing fixtures. The same supplier supplies both. When you are choosing doors, especially exterior doors, you'll want to be thinking about your door hardware. One of the most common problems with exterior doors is leaks during rain. This can be solved by making sure that your overhang for the roof is sufficient. All of the exterior doors on our home are covered by a porch. To date, we have not had a problem with leaking. In our first home, both our front door and our backyard door leaked. The swing of your doors is very important during the architectural design. Most doors swing into a room and out of a closet. When designing a room and choosing a door location, you need to think about where the door will be when it is open. I've presented some examples to the right. Example 1 shows the problem. Your bedroom door is 3' wide and swings into the opening for you bathroom door. Since the door is open most of the time, you'll always have to close the door before you can get into your bathroom. Example 2 shows a possible solution, but it either makes your bedroom larger or your bathroom smaller. You'll have to decide which is more important. Example 3 might be a temptation to solve the problem, but then you will have to open the door 180 degrees to leave it open. Doing so will cause problems for furniture placement. Using doors as in example 3 can dramatically lessen the useable space in a room. Another door swing problem occurs with where you intend to put furniture in a room. You should also consider the door swing for a bathroom so that the door can swing fully without hitting the toilet. The best windows available are from Pella. Pella makes wooden windows with double and triple pane glazing options, Low-E coatings, and hassle-free aluminum exteriors. We chose Pella for several reasons: energy efficiency, quality construction, and between-the-glass shades. Pella offers between-the-glass shades and blinds. This feature tucks the shades or blinds away neatly between the panes of glass and away from dust, damage, and little hands. Pella's window types include double-hung, casement, awning, bow/bay, circlehead, fixed frame, and skylight. 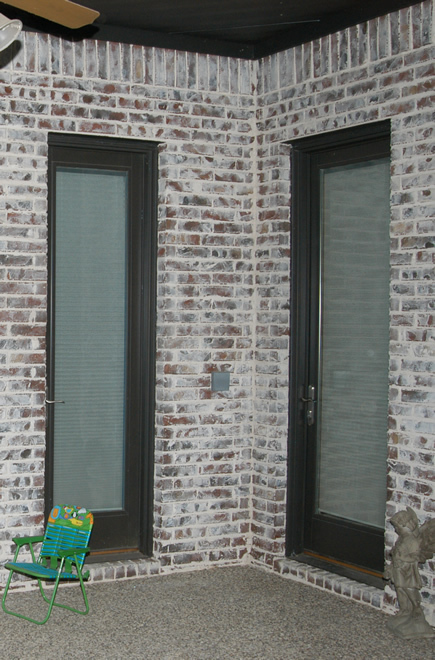 Pella also offers patio doors, storm doors, and entry doors. We used three of their doors. The first door is the entry from the patio. The second door is a laundry room door to our side porch. The third door is for our pool/powder bath. The great thing about these doors is that they let in light through the glass, but they also have between-the-glass shades for privacy. Elegante Iron of Dallas, Texas, provided our front entry door. These unique wrought iron doors have beautiful ironwork and a working 1/2" glass window. Elegante Iron can be reached at 214-342-8987. 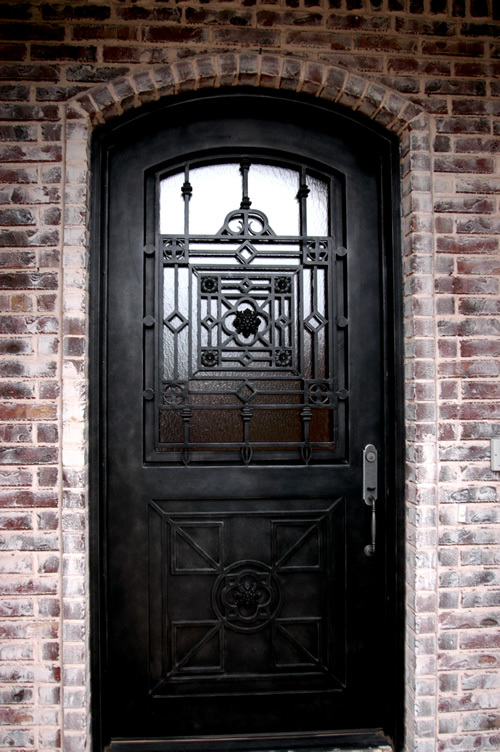 Alamo Designs of Austin, Texas, also makes iron doors.